U.S. President Donald Trump told reporters on Thursday that it "certainly looks" like Saudi columnist Jamal Khashoggi, who has been missing since Oct. 2, is dead. "It's very sad," the president said. When asked what the consequences might be if the Saudis are found to be connected to the death of the columnist, who had written critically about Saudi leaders, he said, "Well, it'll have to be very severe. I mean, it's bad, bad stuff. But we'll see what happens." Earlier in the day, a leaked surveillance photo showed a member of Saudi Crown Prince Mohammed bin Salman's entourage during several trips abroad walked into the Saudi Consulate in Istanbul just before the writer vanished there, drawing the kingdom's heir apparent closer to the columnist's alleged slaying. The man, identified by Turkish officials as Maher Abdulaziz Mutreb, was photographed in the background of Prince Mohammed's trips to the U.S., France and Spain this year. Turkish officials say he flew into Istanbul on a private jet along with an "autopsy expert" Oct. 2 and left that night. Saudi Arabia, which initially called the allegations "baseless," has not responded to repeated requests for comment from The Associated Press over recent days, including on Thursday over Mutreb's identification. The AP could not immediately reach Mutreb for comment. But Mutreb's appearance at the consulate, as well as later at the consul general's residence, adds to the growing pressure on Saudi Arabia amid international outrage over the disappearance of the writer. 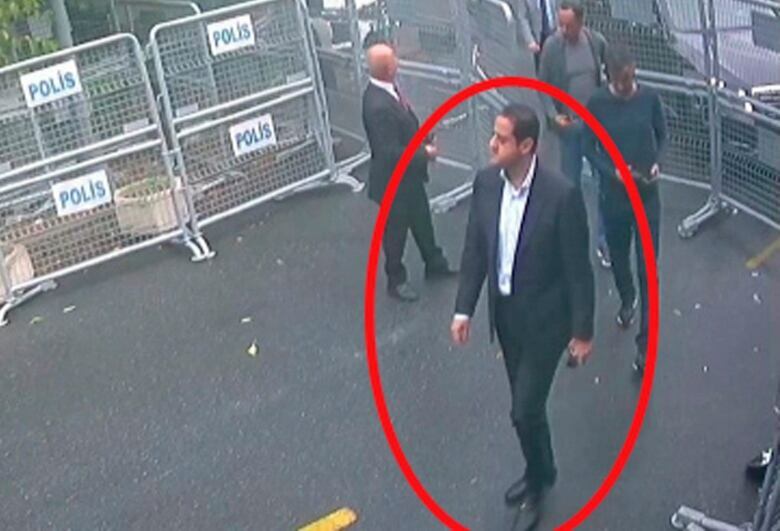 The report from Sabah, a pro-government Turkish newspaper, showed Mutreb walking past police barricades at the consulate at 9:55 a.m. with several men trailing behind him. Khashoggi arrived at the consulate several hours later at 1:14 p.m., then disappeared while his fiancée waited outside for him. On Thursday, the Post published what it described as Khashoggi's last column in honour of the missing journalist. The column points to the muted international response to ongoing abuses against journalists by governments in the Middle East. 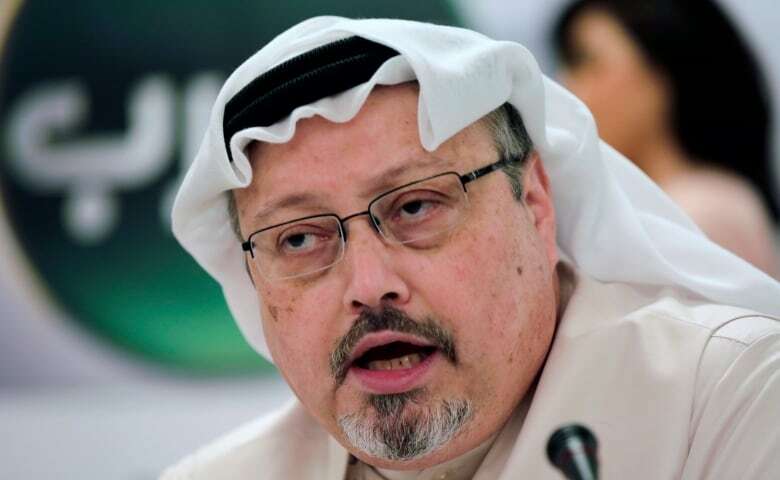 "As a result, Arab governments have been given free rein to continue silencing the media at an increasing rate," Khashoggi wrote. "The Arab world is facing its own version of an Iron Curtain, imposed not by external actors but through domestic forces vying for power." Trump's comments came after U.S. Treasury Secretary Steven Mnuchin said he will not attend an investment conference in Saudi Arabia, as did senior government officials from France, Britain and the Netherlands. Just met with <a href="https://twitter.com/realDonaldTrump?ref_src=twsrc%5Etfw">@realDonaldTrump</a> and <a href="https://twitter.com/SecPompeo?ref_src=twsrc%5Etfw">@SecPompeo</a> and we have decided, I will not be participating in the Future Investment Initiative summit in Saudi Arabia. Several top business executives have also cancelled plans to attend the Future Investment Initiative — dubbed Davos in the Desert — as has the head of the International Monetary Fund, Christine Lagarde. Uber Technologies Inc. CEO Dara Khosrowshahi, CEO Bob Bakish of the U.S. mass media conglomerate Viacom Inc., and billionaire Steve Case, one of the founders of AOL, previously said they were no longer going. Entrepreneur Arianna Huffington will also not participate and has resigned from the conference advisory board, said her company, Thrive Global. At the same time, CNN, the Financial Times, the New York Times and CNBC, as well as reporters and editors from the Economist, said they were no longer participating in the conference, which relies heavily on journalists to moderate top sessions. A report Wednesday by the Turkish pro-government newspaper Yeni Safak, citing what it described as an audio recording of Khashoggi's slaying, alleged a Saudi team immediately accosted the 60-year-old journalist after he entered the consulate, cutting off his fingers and later decapitating him. 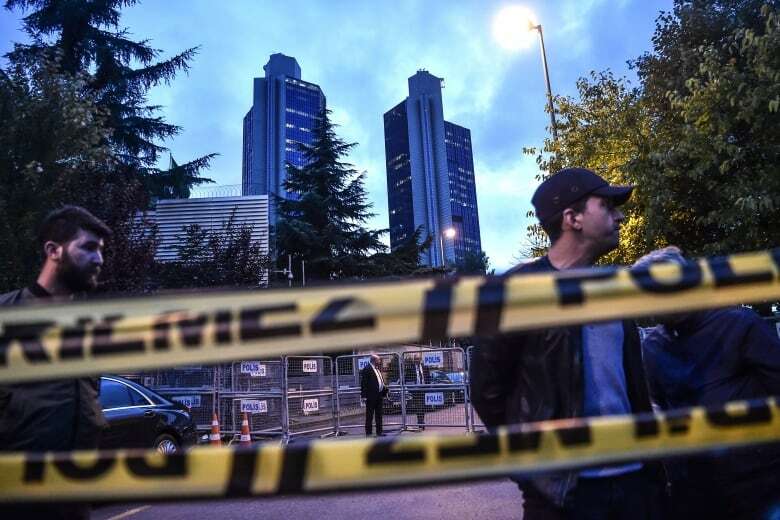 Previously leaked surveillance footage showed consular vehicles moving from the consulate to the consul general's official residence, some two kilometres away, a little under two hours after Khashoggi walked inside. The Sabah newspaper showed an image of Mutreb at 4:53 p.m. at the consul's home, then at 5:15 p.m. checking out of a hotel. He later cleared airport security at 5:58 p.m.
Mutreb's name matches that of a first secretary who once served as a diplomat at the Saudi Embassy in London, according to a 2007 list compiled by the British Foreign Office. The same name also appears in an email published by WikiLeaks from a 2015 breach that showed how governments were increasingly turning to mercenary hackers for hire to pry into the cellphones and computers of their domestic opponents. Mutreb's identity was confirmed by Turkish officials, who spoke on condition of anonymity because the investigation was ongoing. Mutreb also was identified in state and pro-government media reports. The relationship between Mutreb and Prince Mohammed is unclear. Images shot by the Houston Chronicle and later distributed by AP show Mutreb in Prince Mohammed's entourage when he visited a Houston subdivision in April to see rebuilding efforts after Hurricane Harvey. The same man wore lapel pins, including one of the U.S. and Saudi flags intertwined, that other bodyguards accompanying Prince Mohammed wore on the trip. The three-week trip across the U.S. saw Prince Mohammed meet with business leaders and celebrities, including Amazon billionaire Jeff Bezos, who now owns the Post. The searches and the leaks in Turkish media have ensured the world's attention remains focused on what happened to Khashoggi, who went into a self-imposed exile in the United States over the rise of Prince Mohammed. It also put further strains on the relationship between the kingdom, the world's largest oil exporter, and its main security guarantor, the U.S., as tensions with Iran and elsewhere in the Middle East remain high. Secretary of State Mike Pompeo said the U.S. has made it clear to Saudi Arabia and Turkey that Khashoggi's disappearance is being taken "very seriously." "I told President Trump this morning that we ought to give them a few more days to complete that so that we too have a complete understanding of the facts … at which point we can make decisions about how or if the United States should respond," Pompeo told reporters on Thursday. Trump, who initially came out hard on the Saudis over the disappearance but since has backed off, said Wednesday that the U.S. wanted Turkey to turn over any audio or video recording it had of Khashoggi's alleged killing "if it exists." Earlier, investigators spent nearly nine hours in the Saudi consul's residence before leaving, as did Saudi investigators. The search by the Turkish team included the roof and garage and the deployment of a drone over the area. "There are lots of stories out there about what has happened. We just are going to allow the process to move forward," Pompeo said.